Treasury products offer end users a range of opportunities to hedge, speculate or manage risk exposure, and Shariah compliant equivalents are no different. The structure, use and application of Islamic treasury products are, however, governed by very important rules, conventions, documentation and agreements. With Shariah compliant treasury and hedging products becoming more widespread by financial institutions for both risk hedging and for structuring client investment solutions, these rules, conventions and agreements are crucial to the development of these products. 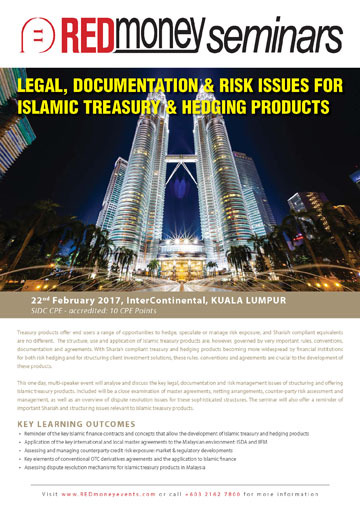 This one day, multi-speaker event will analyse and discuss the key legal, documentation and risk management issues of structuring and offering Islamic treasury products. Included will be a close examination of master agreements, netting arrangements, counter-party risk assessment and management, as well as an overview of dispute resolution issues for these sophisticated structures. The seminar will also offer a reminder of important Shariah and structuring issues relevant to Islamic treasury products.